We made some video tutorials or screencasts for AniTuner. This tutorial shows you how to create an animated cursor from an animated GIF (an animated smiley), add a mouse pointer, export the ANI file and finally configure Windows to use the new animated cursor. 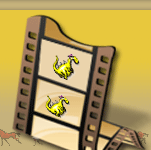 AniTuner can convert animated GIF, AVI video clips and bitmap strips into animated cursors in a snap.